For this Make Monday I made something amazing: the list of my knitting and crochet WIP. It is a good thing because it is not as bad as I thought. So here it goes. This is a darling dress and a great pattern. One of my favourite knitting projects ever. The dress is knitted top to bottom and is seamless thanks to a clever use of increases. It features a lovely smoke pattern on the front panel that is as stunning looking as it is easy to make. I used some Iliade yarn from Phildar (30% wool) in prusse colour and it is just a pleasure to knit because the fabric is so smooth but not floppy. I am far from done but have to hurry because soon it won’t be ok to wear a wool dress: I still have to finish the skirt and the sleeves. The original pattern from Yoko Johnston is here. Everybody loves Kate Davies (or should). Bláithín is a jacket that looks warm and fun. 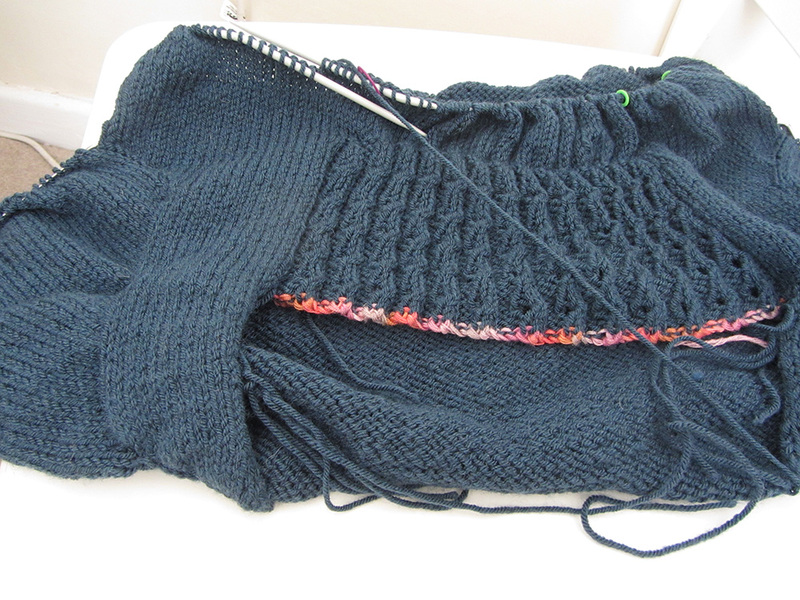 There is some colour work in the yoke and so far I have only the tension squares done. It took me several tries because this is really my first colour work. Otherwise the pattern is full of clever tricks and I can’t wait to get started (I read knitting patterns as bed time stories, do you think it is freaky or nerdy?). Kate Davies’s pattern calls for Soft Donegal but here again I went for the Iliade yarn as they do it in a canard (duck) tone I just love. Check out Kate Davies’ website for more knitting goodness/nature walks/talking dogs. I don’t know why I can never make a hat that fits me: they generally turn out too big and sometimes too small. 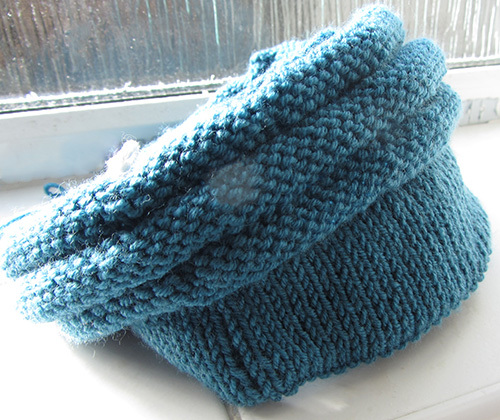 This was until I met Wurm, a stylish hat pattern found on Ravelry too. There is a double layer headband (= warm ears) and as many repeat of the bumpy pattern so you can make a big Wurm if you have a big bunch of hair (which is not my case). I am using Rialto 4 ply by Debbie Bliss and I can’t wait to be finished (but will it happen before the warm Irish summer?). I made a promess to myself I would not buy any more yarn before my stash would get half empty but I had to break it for a good cause: learning how to knit socks of course. I took a course with the lovely This is Knit people and I now know how to make 3/4 of a socks (we’re doing the second lesson next week). But I can already tell I will loooove making socks. 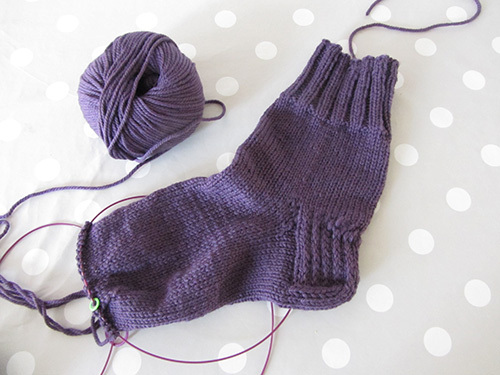 For the time being I am making my first pair in a purple aran by Rico, this is so soft I know my feet will love it. These are going to be my sleeping socks (did I mention my bedroom radiator was dead?). No picture for this project I am afraid as so far I have completed only one (largish) square and this is my guilty-status-quo project. 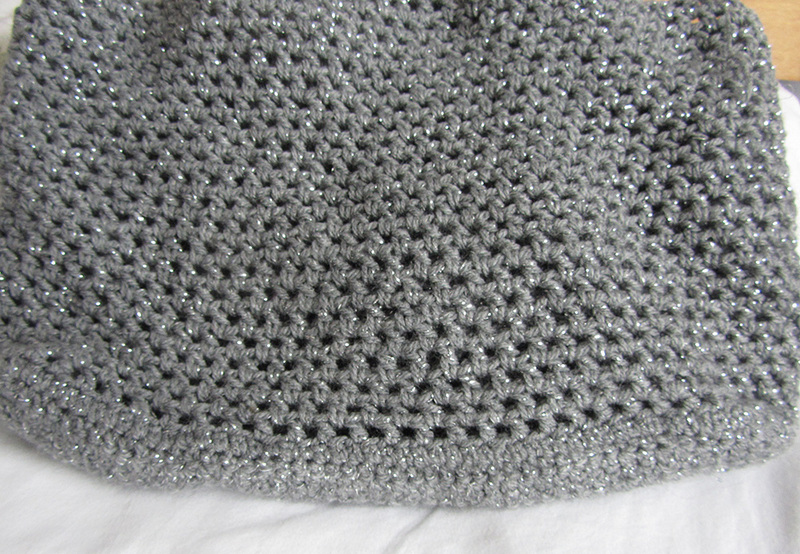 I want to make the square in tones of blue with larger round in grey. This surely will be nice to have blankets on the sofa again (our new dog became owner of all our ones and we are reluctant to claim them back for obvious smelly issues). Four to six months or forty six months? I think it will be the latter. 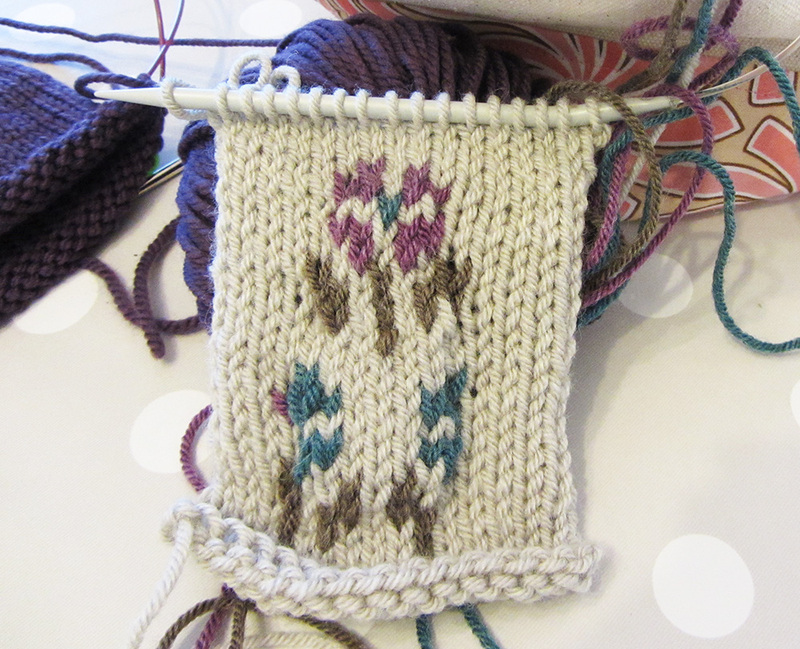 As much as I love this pattern, my brain is currently not available for too much of this. 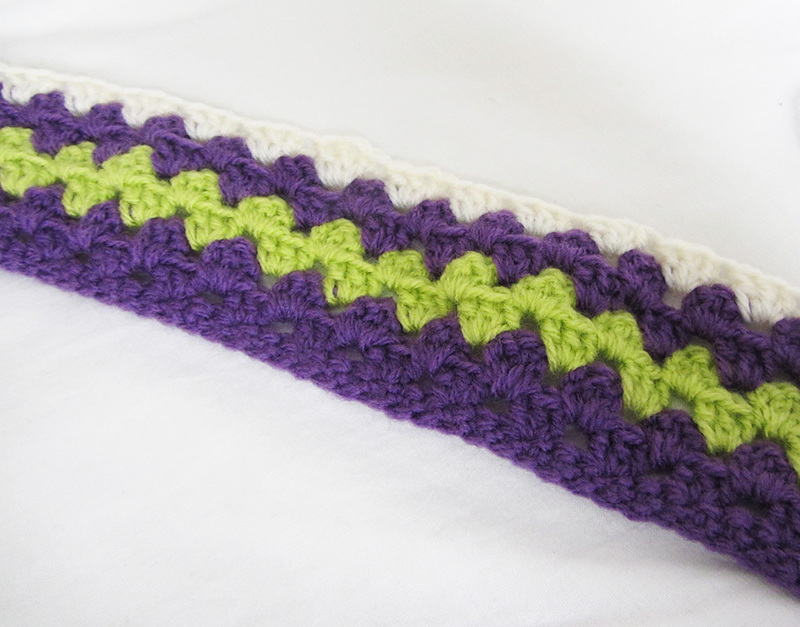 Even if the stitch is simple (2×2 rib with some in-the-back-loop) I can’t make more than one or two rows at a time. Which is a pity because this shawl is so gorgeous! Aka the dog blanket. I am in no hurry for this one as we first need to make sure the dog gets how to deal with a blanket in a socially acceptable way (see above). This was my bus project but I hardly ever take the bus now. However I will try and get this finished as soon as possible as I would love to carry my grey and glittery market bag in the shops. It is not too bad because there is only eight of them WIP – ahem. I am about to cast on an other sock project, somebody tie my hands in my back please. What a wonderful collection of WIPs! The dress pattern looks so so nice. I agree, I am still lost in wonders, this pattern is so much very excellent. I highly recommend though it is a longish project. Ahem. I now have an additional pair of socks in progress. But I really try to focus on the dress because I do want to wear it this year! 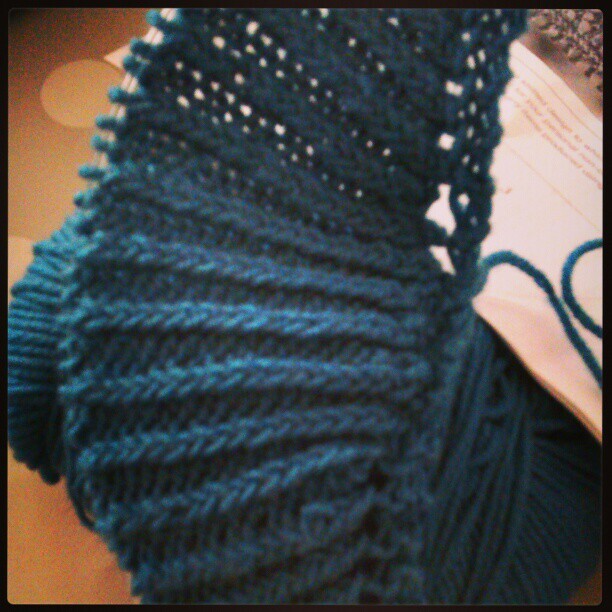 I’m forcing myself to work on only one knitting project at a time (which cannot be said for any of my other endeavors). Once I manage to finish this scarf, which has been 80% completed for 3 weeks and hardly touched, I’ll be making a market bag as well! I like the sparkle of yours! Ho Julianne, you’re so strong to manage only one knitting WIP at a time. One day I will be just like you!